Flying cars n trapping humans like fly's. CLEARLAKE, Calif. — On a recent afternoon, an aerospace engineer working for a small Silicon Valley company called Kitty Hawk piloted a flying car above a scenic lake about 100 miles north of San Francisco. Kitty Hawk’s flying car, if you insisted on calling it a “car,” looked like something Luke Skywalker would have built out of spare parts. It was an open-seated, 220-pound contraption with room for one person, powered by eight battery-powered propellers that howled as loudly as a speedboat. The tech industry, as we are often told, is fond of disrupting things, and lately the automakers have been a big target. Cars that use artificial intelligence to drive themselves, for example, have been in development for a few years and can be spotted on roads in a number of cities. And now, coming onto the radar screen, are flying machines that do not exactly look like your father’s Buick with wings. More than a dozen start-ups backed by deep-pocketed industry figures like Larry Page, a Google founder — along with big aerospace firms like Airbus, the ride-hailing company Uber and even the government of Dubai — are taking on the dream of the flying car. 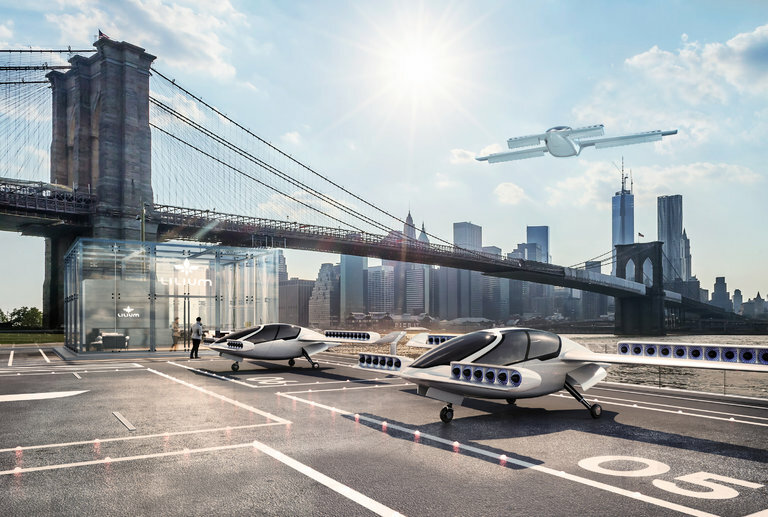 The approaches by the different companies vary and the realization of their competing visions seems far in the future, but they have one thing in common: a belief that one day regular people should be able to fly their own vehicles around town. There are challenges, no doubt, with both the technology and government regulations. Perhaps the biggest hurdle will be convincing the public that the whole idea isn’t crazy. Kitty Hawk, the company backed by Mr. Page, is trying to be one of the first out of the gate and plans to start selling its vehicle by the end of the year. The company has attracted intense interest because of Mr. Page and its chief executive, Sebastian Thrun, an influential technologist and self-driving car pioneer who is the founding director of Google’s X lab. In 2013, Zee Aero, a Kitty Hawk division, became the object of Silicon Valley rumors when reports of a small air taxilike vehicle first surfaced. During his recent test flight, Cameron Robertson, the aerospace engineer, used two joysticklike controls to swing the vehicle back and forth above Clear Lake, sliding on the air as a Formula One car might shimmy through a racecourse. The flight, just 15 feet above the water, circled over the lake about 20 or 30 yards from shore, and after about five minutes Mr. Robertson steered back to a floating landing pad at the end of a dock. [url] CLEARLAKE, Calif. — On a recent afternoon, an aerospace engineer working for a small Silicon Valley company called Kitty Hawk piloted a flying car above a scenic lake about 100 miles north of San Francisco. LONDON — As interest in flying cars continues to swell, one of the most prominent start-ups working on the technology has gained a big new backer. Lilium Aviation, a German company that held a successful test flight of the Eagle, its two-seat electric jet, at its Munich base this year, announced on Tuesday that it has raised $90 million in a new round of financing. The investment was led by Tencent Holdings, the Chinese internet giant. Other investors in the round included LGT, the investment vehicle of Lichtenstein’s royal family; Atomico, the venture firm run by a founder of Skype, Niklas Zennstrom; and Obvious Ventures, the investment firm co-founded by the Twitter co-founder Evan Williams. Mr. Zennstrom has previously invested in the company. Lilium is among several companies looking to usher in an era of Jetsons-type flying cars, including those backed by the Google co-founder Larry Page, Uber and Airbus. But the two-year-old company is trying to stand out by focusing on an electric jet — unlike other models that effectively function more like hovercraft. The design, by the four graduates of the Technical University of Munich who founded Lilium, is meant to be more energy efficient than competitors’ models. As the start-up demonstrated with its Eagle in April, Lilium’s vehicle is designed to take off and land vertically, like a helicopter. Lilium is also working on a bigger, five-seat version of what it calls an “air taxi” that could ferry passengers or cargo as far as 300 kilometers, or 186 miles, and reach a maximum speed of 300 kilometers an hour. “We have highly congested cities where we can do things to improve matters,” Remo Gerber, Lilium’s chief commercial officer, said. He and his colleagues envision a fleet of air taxis zipping across crowded cities, once the vehicles are created and approved by the various regulators, of course. “We’re trying to move from a niche transport vehicle to a mass-transport one,” he added. That has obvious appeal to Tencent: Its e-commerce empire could benefit from making such air transport a reality. “From underdeveloped regions with poor road infrastructure, to the developed world with traffic congestion and sprawl, new possibilities emerge when convenient daily flight becomes an option for all of us,” David Wallerstein, Tencent’s chief exploration officer, said in a statement. The cash infusion from Tencent and other investors will help accelerate that work, and allow Lilium to expand beyond its team of roughly 70 employees, Mr. Gerber said.